Every single week we learn somethi ng new. We never stop learning. Farming is a profession where your weakest link and your biggest problems are apparent almost immediately. When Jonathon and I decided to start Forager Farm, we had a combined vegetable growing experience of roughly 10 years. We also had one full CSA season under our belt from our time spent working and learning at Captain’s Creek Organic Vegetable Farm in Australia. But as for experience with starting a new farming business in North Dakota, we had none. We were and still are, highly unprepared in so many facets. When I first began thinking about this blog topic and what I would write, the most glaring point was that farming, more than many other professions, is a “learn as you go” job and way of life. This is a blessing and a curse. There’s so much beauty in realizing your mistakes and how to fix them, but so much frustration in having to wait for the next growing season to implement your new ideas and strategies. My first taste of farming was nearly two years ago during our six-month stay in Australia. One of the items we were tasked with when we first arrived was to weed the beet beds. Anyone who has weeded young beets can understand what a hair-pulling experience it is, let alone leaving subzero temperatures in the States for near 100 degrees days in the Outback. I didn’t know what I had gotten myself into. 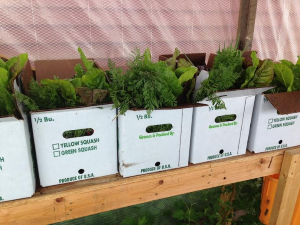 However, by the end of that week we had also harvested for and worked our first farmer’s market and quickly thereafter started our routine of pick-and-pack days. These are the areas where I felt confident. Not without hesitation, but I was sure I could handle it. Which was true, but there’s only so much you can prepare for. Often overlooked when preparing to start a farm is the mental and emotional capacity needed to persevere through all the ups and way, way downs. You can read every book, watch every video or talk to every experienced farmer, but you’re not going to find “how to keep sane” written across pages or screens or faces. You have to find within yourself the fire to fight through it all. So much of our lives the past two years has been this mantra: “figure it out.” We jumped head first into this adventure and never looked back. Admittedly, we took on too many things at once. We were fearless and felt strongly that this was what we had to do, this is what we were meant to do. And although we still feel this way, we’ve been able to take a step back and clearly see where we’re getting it right and where the bits of training we’ve had has paid off. But you can never fully prepare for new adventures and that’s the beauty of it. he last month around here has seen some very exciting times. 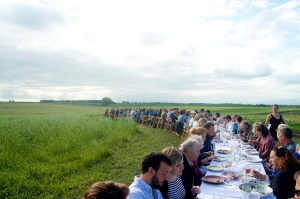 At the end of July we hosted an on farm dinner with Oustanding in the Field, an organization “setting tables at the source of ingredients, serving from farm to table across the country.” It was a dream come true for us. We met so many lovely folks who reminded us there is a growing community of food lovers and supporters. Making all of this year’s hard work truly worthwhile.